On the previous page we pondered mysterious bits of iron chain made by persons unknown for a purpose unknown, found coming out of the ground in Bootham Park. While on the subject of interesting bits of iron found underfoot here’s another example stumbled upon in recent wanderings. This one’s not mysterious, but proclaims its maker quite clearly. It was made by W & T Avery. I discovered it a couple of months back through an opening off Piccadilly alongside the Banana Warehouse. I like Piccadilly, that part of it, with its relics of early 20th century life. Down at the bottom end it’s all tall looming late 20th/early 21st century, light-blocking and charmless. Here in the middle ‘unimproved’ bit are reminders of the life of this street, of how it started and what it was used for in the early 20th century when it was created, connecting through to Parliament Street and Pavement. This relic of former times wasn’t made by our local iron foundries. It not only proudly proclaims its maker but the place it was made. Birmingham. 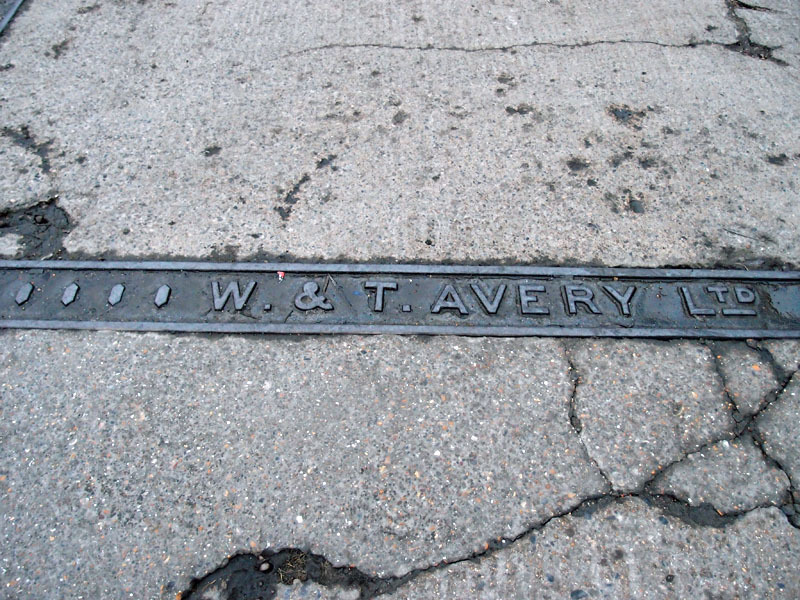 And a quick bit of research on Google suggests it’s the remnant of a weighbridge, because that’s what W & T Avery made. The opening leads to the backs of a couple of Piccadilly properties, so what the weighbridge weighed in its time I’m not sure. Bananas, perhaps, for the Banana Warehouse? Or something else? This was a street with garages along it, and a lovely old 1906 catalogue I’ve discovered while researching Avery weighbridges includes ‘Avery’s Patent Combination Motor-Wagon Weighbridge‘, for the ‘Motor-Car’, ‘in conformity with the Motor-Car Acts’. The catalogue is worth a look as it includes many other delightfully-named creations, but I think my favourite is ‘Avery’s Special Secret Weighing Machine‘. If anyone can identify what type the York one is, or confirm what it weighed, please add a comment. 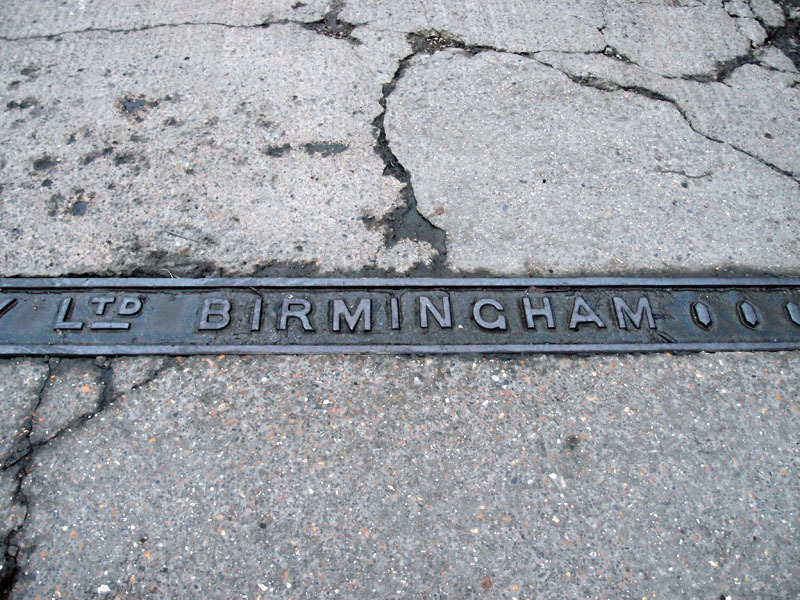 Whatever it’s called and whatever it weighed, I hope that when the Piccadilly site is redeveloped it will be rescued or retained, this reminder of a bit of Birmingham’s industry. Regarding the W & T Avery “piece of iron” Burley’s were a Wholesale Fruit & Vegetable Merchants so it is possible the weighbridge was something to do with that. I remember their lorries coming to pick up potatoes from our farm in the late forties/early fifties.